My scrappy butterfly are doing nothing to lower my scrap bins......but they are making such nice blocks. I am not sure if they will end up being many wall hangings or a quilt :) Looking at my bins I could easily do 6 in total. 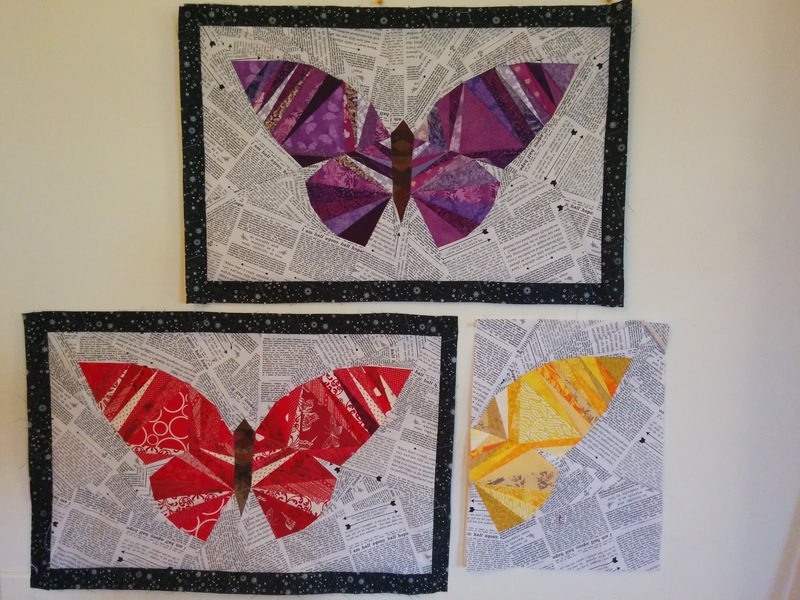 A quilt of scrappy rainbow butterflies would be amazing! These are wonderful. I agree with a rainbow of butterflies. Wow... so pretty! LOVE the background and how it makes them pop!! Would be incredible as anything! They are beautiful! I like the newspaper print background on those blocks. I love these butterflies. They are so beautiful. What a lovely pattern. I like the narrow scraps and the newsprint you used as background. Thanks for linking with the Kaleidoscope of butterflies. ooolala I love these blocks! Thanks for linking up! I love your butterflies! And I love this pattern. I have it, just haven't made one yet! Really beautiful!! Thanks for sharing!! Oh my gosh....these are fabulous......I can see how your technical skills transfer to quilting so successfully!